Franks and Berms is back, Tell a Friend! Do you like riding trails maintained by KyMBA? Do you like to meet awesome people? Do hot dogs make you happy? Then come to the the first Franks and Berms Ride of 2019!! No matter your skill level, we want you to ride with us. This will be a very casual, no-drop ride. We had so much fun with these last year that we couldn't resist kicking them off again this spring. 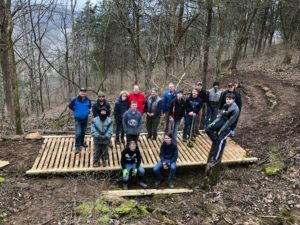 For those who aren't familiar, this is a monthly fundraising and social event designed to bring Bluegrass mountain bikers of all skill levels, riding styles and pedal preferences together to raise money to help KyMBA maintain our trails while enjoying a casual, no-drop trail ride. For $5.00, you get to hang out with your fellow riders, enjoy a mountain bike ride on the trails of Veteran's Park in Lexington and eat a tasty hot dog (or veggie dog) at the end. KyMBA and some of our generous sponsors will provide the food and hydrating beverages when you wrap up your ride. COME EARLY AND THROW A LEG OVER A BRAND NEW KONA BIKE-- courtesy of our friends at Broomwagon Coffee and Bikes. They'll be out at Veterans Park from 2-6 hosting a Kona Bikes Demo. We hope to see you all out on the 3rd! Please RSVP so we know how much food to provide. AND JOIN KyMBA BLUEGRASS TODAY!! Celebrate Earth Day by help finish up this trail project in downtown Frankfort! Parking near the top of the park (second turn off on the right). Look for the BIG red Ford F-150 with trail tools along side. Check out our Facebook page for more details!